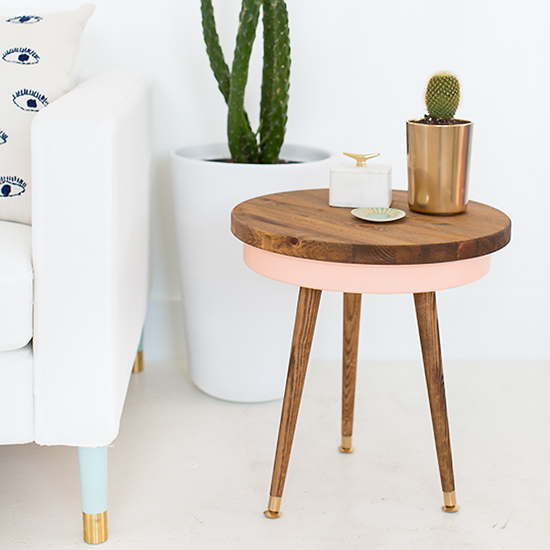 Ashley Rose is the clever crafter behind Sugar & Cloth, a source for everything from DIY furniture—like a cool pegboard bed and this mid-century-inspired side table—to pretty Jell-O shots and easy Nutella brownies. She also hosts DIY and brand-building workshops at her newly designed Houston studio. We recently caught up with her speed date-style: five questions in two minutes. 1. When people ask you what you do, what do you tell them? I tell them I'm an online publisher. It's funny how people hear the word "blogger" and think that means that I don't work hard or that I'm not an established brand and business. 2. Is there one DIY project or hack that you're particularly proud of? My DIY fruit macarons project is always going to be an all-time favorite! 3. What's always in your fridge? La Croix! I'm a soda water fiend. 4. What's your dream food day? I think a bakery tour in just about any foodie city would make my year. It's the one thing I always, always seek out when we visit new places. I'm like a moth to a flame, really. 5. What are some of your favorite Houston spots? Tout Suite is one we frequent pretty much every day—since our studio is just upstairs—for coffee or breakfast. Weights + Measures is my newest favorite for dinner and cocktails. Myth & Symbol or Montrose Shop for clothing and sweet nothings. Julep for happy hour.